Next June is the 10 year anniversary of when I started on my fitness and weight loss adventure. Lately I've been brainstorming ways of paying it forward, and figure sharing some of the best lessons I've learned is a great place to start. When I first started out, stringing together more than a couple days of eating on plan or exercising was super challenging. Eventually one day turned into two, which turned into a week, then months, and years. 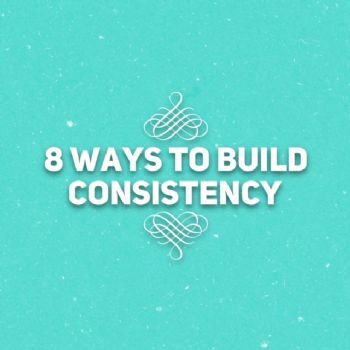 Here are some of my favorite ways to build consistency. Let me know what you think! 1. Remembering that consistency is built over time, and that the upward trend is more important than a bad day or two (or week/month/year LOL). 2. Look for all-or-nothing thinking, and challenge it. Are you being a perfectionist or unrealistic with your expectations? 3. Pick ONE battle to fight. It's so easy to want to make ALL.THE.CHANGES. at once, and to have them be done overnight. When I'm highly motivated, I might be able to hit it really hard for a short time, but eventually I burn myself out. So when things get tough, I pick one thing (usually a back-to-basics thing) and devote my energy to that. 4. Ignore my feelings. When my inner 2-year old is throwing a tantrum and crying things like "I can't do this", "I don't wanna", "Why?!?! ", or "I don't feel like it", I ignore it and stick to the plan. 5. Throw yourself a pity party. Set a timer for 10-60 minutes and go full-on feeling sorry for yourself. Once the time's up, move on. 6. Remind yourself of your "why." What's your honest-to-goodness, deep-in-your-soul reason for doing this fitness/health/weight loss thing? 7. Answer "What do I want for myself?" Get very specific. Get detailed with your senses - what will you see/hear/touch/smell/taste when you get what you want? What thoughts will you have, what emotions will you experience? 8. Take a teeny tiny, smaller-than-a-baby-step action. When you want to quit and give up, take a miniscule action that's worth doing to keep moving forward. I'm talking so small that it's IMPOSSIBLE to fail, and that sets you up for inevitable success. Thanks for the share. I LOVE, LOVE, LOVE theses tips for real life reflection.